Who could have known that Atkinson and Griff Rhys-Jones would turn out to be such soothsayers?! As it ‘turned out’, it was a case of mistaken identity. The motorist was completely innocent and has now made a formal complaint against PC Savage. 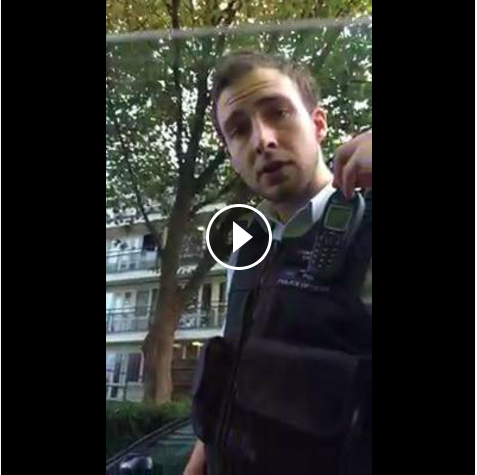 With a social media storm kicked off, due to this circulating video, the Metropolitan Police was forced into immediate action and (the) Savage is now on restricted duties, pending an investigation. And I can only agree. The one slither of silver lining is that our police officers don’t carry guns like the trigger-happy Americans. Or the Savages of this world would be trying to justify bloodshed, instead of broken windscreens. However, rest assured that the mental wounds inflicted by officers like Savage run deep. This entry was posted in Comment, London Life, World Events and tagged comedy, court jesters, Kyle Adair-Whyte, Met, Metropolitan Police, Not The Nine O'Clock News, offenders, police, politics, racial profiling, racism, satire, South Park, Spitting Image. Bookmark the permalink.